A lot of phone for the money. Has a headphone jack, but no band 20 though. It is far cheaper elsewhere on this site. 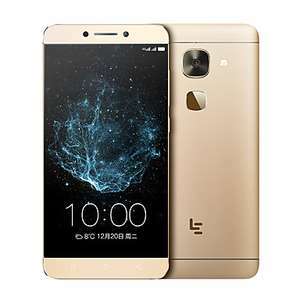 Think the reason this is so cheap is because the company (LeTV) are having financial troubles (?) and this phone won't be well-supported with Android updates. I did see a few reviews saying they reckoned their review units were a bit buggy as well. Obligatory UK network related question alert! Seriously though, I am with Vodafone, so will this work ok on that network? Appreciate the 4G issues given lack of band 20 support, but will it function ok? Also, any complexities or work to be done around the OS once it arrives, or will this be on that works globally? Obligatory UK network related question alert! Seriously though, I am with …Obligatory UK network related question alert! Seriously though, I am with Vodafone, so will this work ok on that network? Appreciate the 4G issues given lack of band 20 support, but will it function ok? Also, any complexities or work to be done around the OS once it arrives, or will this be on that works globally?Any advice appreciated. As it has Mediatek soc there won't be plenty custom roms available. So most probably you will be stuck with android 6. I have been waiting for my phone for almost 5 weeks with express delivery. The parcel was shipped 31 days after placing the order (express delivery). Today I was surprised by DHL message asking to pay extra £36 duty charges - I paid extra for Duty insurance they offered. Only problems - stay away! I have been waiting for my phone for almost 5 weeks with express delivery. …I have been waiting for my phone for almost 5 weeks with express delivery. The parcel was shipped 31 days after placing the order (express delivery). Today I was surprised by DHL message asking to pay extra £36 duty charges - I paid extra for Duty insurance they offered. Only problems - stay away! They offered to pay 50% after sending an image - why bother paying insurance? But 4 weeks express delivery is a little bit long, don't you think? £36 duty how much did you buy it for? Press them on it, I've had a few things and they reimburse you after you pay it (as most of these companies do). The ridiculous prices aren't helped by an £8!! fee the PO charge you on top. Just a heads up, got 3 (gearbest) of these for kids xmas. I've tested 2 so far and both had a terrible lock up reboot issue. Read around, and the fix is to update google play services; after doing that the 2 I've tested run great now. Please check the dates - top email was sent on 2.12.2017. So who got one and what's the camera like?